Der Artikel Syl Johnson: Back In The Game wurde in den Warenkorb gelegt. 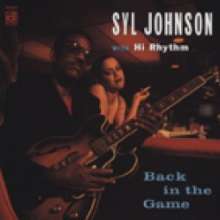 Syl Johnson is one of the uniquely gifted voices of R'n'B. He is from the musical family that brought the world bluesmen Jimmy Johnson and Mac Thompson. Syl established himself with hits like Come on Sock it to Me and Take Me to the River. These songs are now sampled by rappers such as Wu-Tang Clan, TLC, and Hammer. Reunited with the Hi Records band, Syl Johnson is BACK IN THE GAME!